I trained as a veterinary surgeon. Working for 10 years in both large and small animal practice. During this time I created a number of wall murals, studied life drawing and was continually painting. I moved to France in 1992 where I studied decorative porcelain painting with a skilled crafts woman, moving on to ceramic work and subsequently to study sculpture and ceramics at l’Atelier des Beaux-Arts Henri Matisse, Creil for 3 years. During this period I lived in an isolated house in the middle of an ancient deer forest. Here I spent long time studying, drawing and sculpting the deer, the work from which my deer sculpture is developed. I returned to the UK in 2002. My workshop is close to Bath where I create pieces in ceramic, porcelain and glass, papier-mâché, bronze and cement/fibreglass casts. I was a founder member of The Art House Gallery Co-operative, Bradford on Avon. 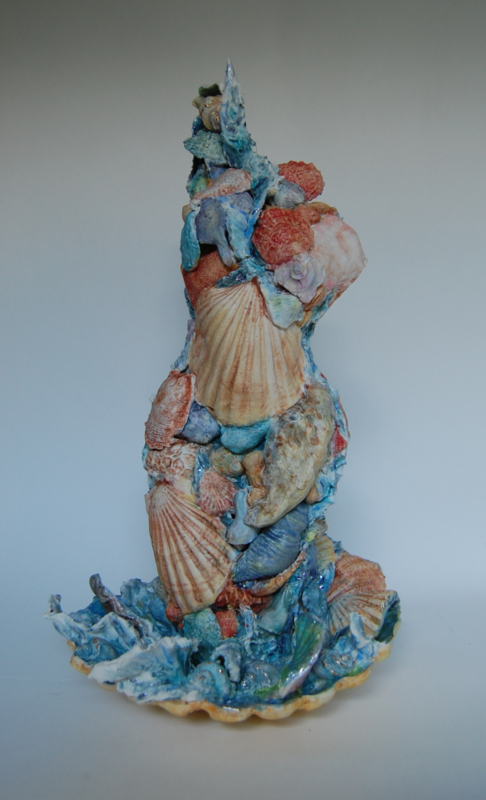 My work moves from fine art to ceramics, the ceramic work having its roots in my sculpture. For both ‘Art’ and functional pieces I prefer to work from life. Be it flora, fauna or the life form my passion is to represent the character and mood rather than just a physical form. I aim to bring to each ceramic piece the design and movement for which my sculpture is known. I particularly enjoy catching movement, as shown by my many versions of washing lines, and my large floral paper pulp wall pieces which combine a slightly out of control medium with the out of control wild floral image. I love 3D work, the infinite number of views, and planes to be found, and the constant investigating of new materials and their properties. This curiosity is probably my own worst enemy; always having ‘itchy fingers’ in the materials I work with, the surface finishes, or the styles. I enjoy overcoming the technical problems of each medium. Working in porcelain maintains function in ornate pieces. My method of layering in building creates an air of delicacy whilst maintaining strength and practicality. I incorporate original ceramic pieces into large mixed media wall pieces, taking the traditional and doing the unexpected. Each of my pieces is original. It is rarely I recreate an image or idea, and if I do it will always be with elements of change. I delight in storytelling both in art and with the written word. I have won prizes both for poetry and short stories and performed poetry. Some of my work uses both the word and the form to bring my message to the viewer. Sometimes I only really understand what drove me to create an image after it is finished. With both word and image I love to make people look and think again. I move between sculptural and decorative ceramic pieces and though the viewer may initially see them as very different, they are vital to each other, and feed off each other enormously. In July 2014 I was elected an Associate Member of The United Society of Artists. In December 2015 I was elected a full member of the society.